The word impossible is not in my dictionary. In April and June of 2013 I was in Ghana for the Responsible Recycling project. During those trips I had the privilege to visit Agbogbloshie, a scrap-dealers compound in Accra. Agbogbloshie, is home to about 5,000 workers, mostly from rural areas of Ghana. These men, women and children spend day and night collecting, breaking apart and sometimes re-assembling everything from your old Mazda 323 to mobile phones, laptops and refrigerators. On both visits there, I saw men and women working very hard constructing, de-constructing and selling items. Working hard for their money in a country where begging is also a big culture. This was promising. Unfortunately, I was also confronted with the negative aspects of this community. Young men/boys collect electronic and other metallic scrap from around Accra on pushcars. They wheel these pushcars by hand to Agbogbloshie, where they sell the items they have collected to their bosses, or simply to those offering money for them. Workers in Agblogbloshie purchase these items, often with money that they took out on a loan that same morning. These workers then disassemble and sort out these items. They separate the valuable from the less-valuable items, and sort the different parts into piles they can sell separately. The working parts are sold to others in the community that will assemble new products from them; sometimes 2 or 3 broken laptops can end up as one working laptop, which they can then sell. Quite a few of these 'laptop specialists' can be found in the compound, with piles of working laptops for sale. Raw materials such as copper, lead, aluminium, etc. 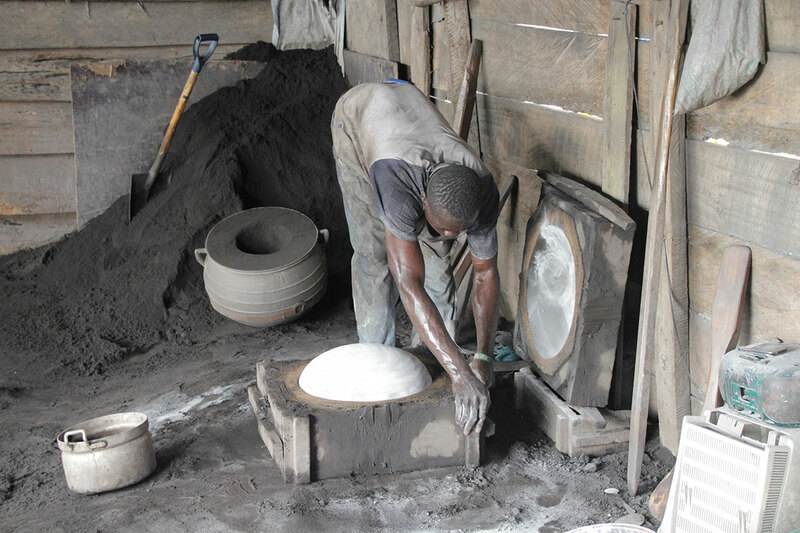 are sold by the kilo, sometimes to organisations exporting these materials, and sometimes to others in the community that create new items such as cooking pots and coal stoves from them. Any materials covered by plastic are burnt in order to keep the metal, and get rid of the plastic. And what do they use in order to get a nice, hot fire? Foam from old refrigerators, filled with harmful CFCs. Whatever is left over and (for their purposes) worthless is dumped on the ground, or in the lagoon nearby. This system creates value where many would not see value. Think your old TV is worthless? Not to these people! Think your laptop is too slow? They don't! The system also 'employs' a very large number of people, that might otherwise be begging or simply costing money. With an open mind, there are many positives about the community at Agbogbloshie. Unfortunately, we cannot ignore the negative side of the situation. The plumes of smoke containing carcinogens, CFCs and other harmful substances billowing into the air. The underaged boys that hack away at car parts without protection, and the extreme pollution of the nature around the site. The photos in this post tell the story quite clearly. So how can we solve this problem? How can we focus on the positives of this community (hard-working people, a functioning economy, cradle-to-cradle) and use them to get rid of all the negatives? I think the answer is simple: investment. 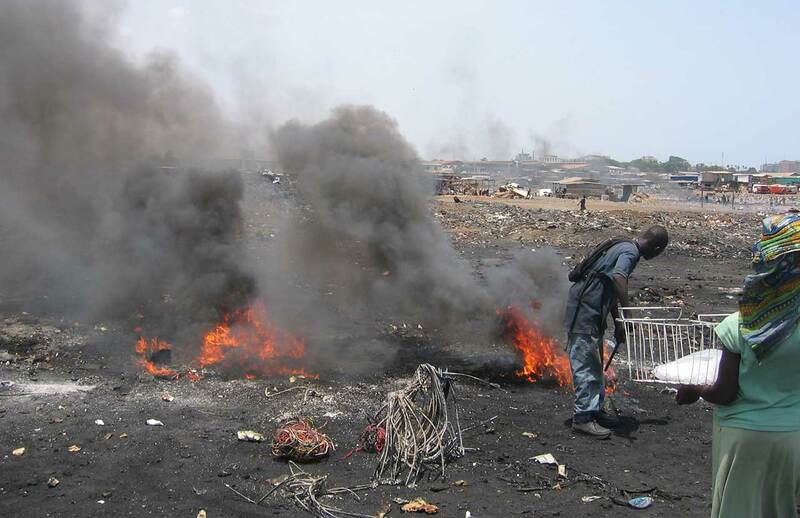 With little or no alternatives in Ghana for recycling, the workers and the public have no choice but to let their scrap end up in Agbogbloshie. But what if we set up recycling plants around Accra to handle all this scrap? Everyone knows there is value in waste, and a business case in this situation is easy to make. Some might say one of the biggest challenges in setting up a business is a good work-force. Well that problem is also solved. There are already thousands of people at Agblogbloshie that can take apart your television faster than you can go buy a new one. All they need is a good working environment, training and financial incentive to work in this way. So what are we waiting for? Why don't we start investing in recycling in developing nations? See our project on Responsible Recycling here.